Xerox fellow Breanna O’Reilly and Associate Professor Catherine K. Kuo examine part of a bioreactor that was custom built by Kuo’s lab. 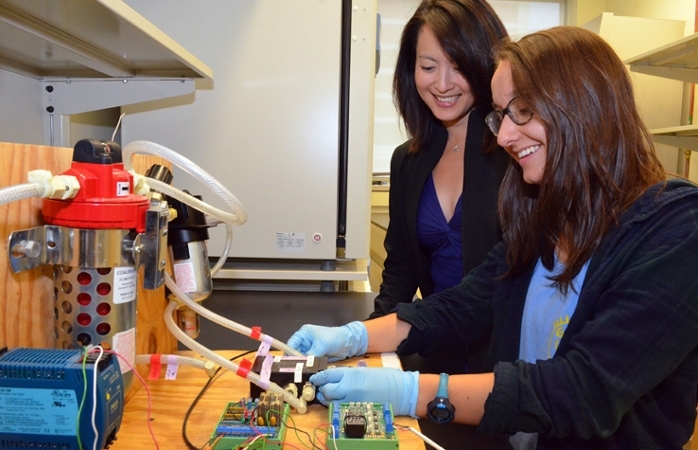 “I have learned more from a week of being in this lab than I probably could have in a semester of classes,” says Xerox fellow Breanna O’Reilly, a rising senior in biomedical engineering who is working with Associate Professor Catherine K. Kuo. Kuo’s lab studies embryonic tissue, specifically how it can be used as a model for growing tendon replacement tissue in a bioreactor. Tendons are composed primarily of fibers of collagen protein. Actual tendon cells and blood vessels are scattered in such small numbers along these fibers that it is difficult for damaged tendons to heal properly -- hence the interest in cultivating replacement tissue. Part of O’Reilly’s work this summer is helping set up a bioreactor that is custom built by the Kuo lab. O’Reilly has also been exploring a possible new research topic, spurred by something Kuo noticed from a prior experiment. Kuo simply told O’Reilly the name of a particular enzyme, asked her to research it and come back with possible ways it might be integrated into the lab’s research. She’s also had an opportunity to do some mentoring of her own. This summer, Xerox fellows interacted with high school students participating in an Upward Bound precollege program. At a kick-off event and subsequent weekly breakfast meetings, fellows described their projects, answered questions and, in turn, listened to the high school students share their own dreams. “I was a little tentative about doing it at first, but it ended up being a really wonderful experience,” O’Reilly said.